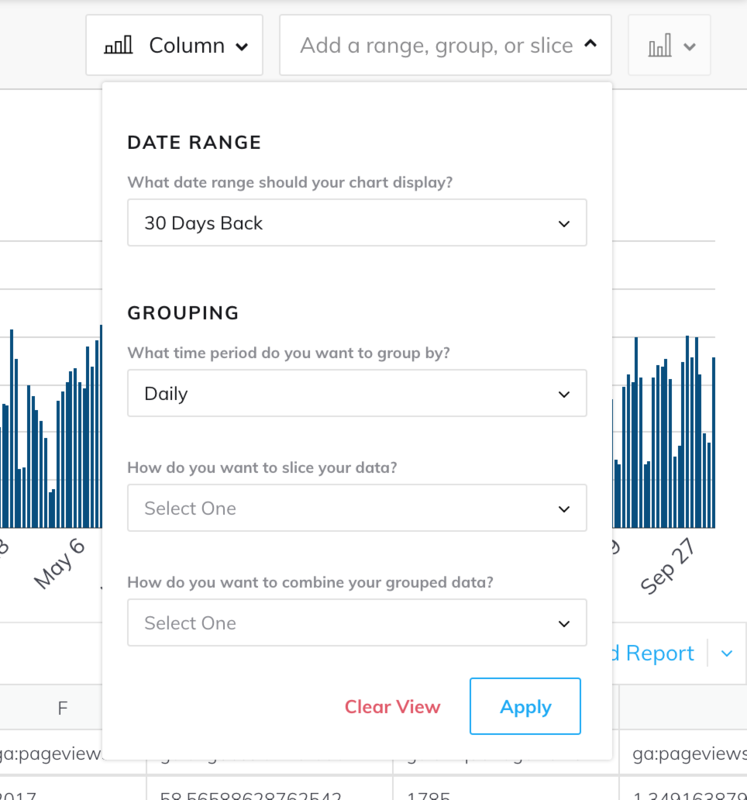 Grow's Data Explorer allows anyone to make metrics in a simple quick way. To best use the Data Explorer, you have to get your data to a point where you have the numbers you want to use in the chart (revenue, website sessions, etc). Sometimes you may have to group your data to get some numbers to use (like getting a count of leads by lead source or month). Using a dataset or another good source of data, pick the column you want to chart by Adding a Value. 2. Then click the data exploration bar at the top of the chart. 3. Pick the date range, and what time period you want to group by. You can also select an attribute you want to slice (pivot) your data on. Adjust the way the grouped data is combine if needed, it defaults to sum. 4. Click Apply and you are done. Need to change the date range? Few clicks and you are done. Want to slice by a different attribute? Simple. Here is a quick gif walking you through the process. At the top right, you can also click on the chart/table buttons to toggle between the chart and table view to see just how Grow is using the data to make your chart. Q: Does the Data Explorer work on data without a date in the x axis? A: Currently the Data Explorer will only work if you have a date in the x axis. We are working on supporting any type of data. Q: Why does it sometimes take a while to run? A: The Data Explorer is performing multiple calculations on your data. It should be quick but if you have a lot of rows of data, it can be a bit slower. *Note: This feature used to be referred to as Chart Level Transforms upon its initial release.